Here are a few issues that I have come across in my visits to different homes. Problems or defects discovered during a home inspection could be minor inexpensive fixes, or they could be costly to repair. The important thing is that you are aware ahead of time so that you can make an informed decision. Knowing what you are getting into is important to both of us. Gutter systems help guard against water intrusion to many other systems. They need to be properly fastened so that the water doesn't cause damage elsewhere. There is a lot going on in this small junction box on the wall behind me. Into the crawlspace to find out more, then back to the electrical panel. Missing downspouts can cause costly repairs and moisture intrusion. 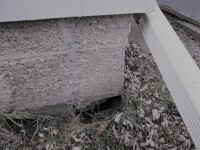 This new downspout extension was a clue to look deeper, foundation wall defect below. This basement window has been replaced with glass block. However, the driveway asphalt is higher than the base of the window. This creates a "ponding" spot for water. The seal around this vent stack has deteriorated to the point where the rubber has cracked. This crack and others will allow water to enter through the roof into the attic and further into different systems and components of the house. These seals should be checked regularly to keep the water out. If you look closely at the wooden bottom cord of the truss in the exposed insulation you can see that at one time there was a can light installed and whom ever did it cut into the truss. Engineered Trusses should never be moved, modified, or in this case cut. This image was taken from inside the garage facing the fire wall to the home. 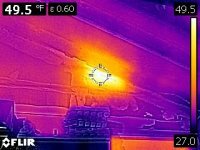 The bright yellow "hot" area turned out to be a warm-air heat register in an upstairs bedroom. The register depth took up all the space in a 2x4 wall so there was no room for insulation. 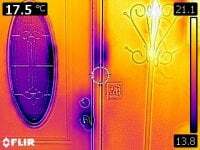 With the right conditions the thermal camera can see the cool spots where outside air is getting in. Some air infiltration is expected around the lock-set "purple area", but not generally in the middle of the trim. Most likely there is missing insulation between the door jamb and the rough opening. Removal of the trim would be needed to know for sure.